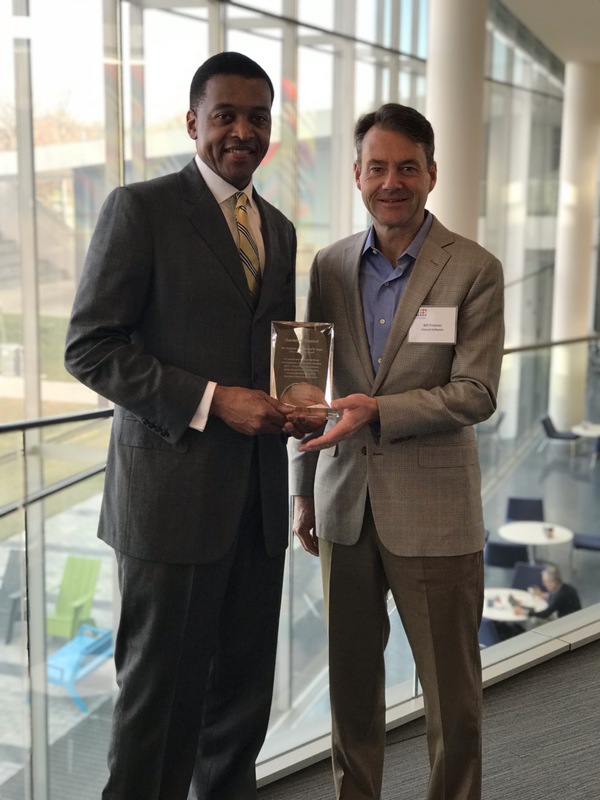 CLEVELAND, OHIO – Today, Business Volunteers Unlimited (BVU) announced Randell McShepard as the recipient of the 2019 Richard W. Pogue Civic Leadership Award. McShepard, a longtime community leader, receives the Pogue Award the year after its inauguration honoring the namesake as part of BVU’s 25th anniversary. The Pogue Award recognizes an individual who serves as a role model for community engagement, board leadership, volunteerism, philanthropy, and business support of Northeast Ohio’s nonprofit sector. McShepard has worked in leadership roles with a variety of nonprofit organizations, including BVU, Sisters of Charity, Union Club, Cleveland / Cuyahoga County Workforce Investment Board and the Fund for Our Economic Future. McShepard co-founded Policy Bridge, as well as BVU’s Minority Board Member Pipeline initiative to address diversity and inclusion on nonprofit boards in NEO. McShepard has also served on the George Gund Foundation Board of Directors, as well as, that of Baldwin Wallace University. In public sector service, McShepard served on the Executive Committee for the Cuyahoga County Government Reform transition in 2010, and was the chair of the Kenneth Clement Elementary School Advisory Board, an all-male Cleveland Metropolitan School District school, assisting with development, fundraising, talent sourcing for tutoring, supplies, and critical scholastic needs. McShepard is the vice president – public affairs and chief talent officer of RPM International, Inc., a world leader in specialty coatings and sealants. A graduate of Baldwin Wallace and Cleveland State Universities, Mr. McShepard is active with professional affiliations as well, including serving as the National Chairman of the Public Affairs Steering Committee with the National Association of Manufacturers. McShepard and his wife reside in Beachwood, Ohio with their three children. ABOUT Business Volunteers Unlimited: Business Volunteers Unlimited (BVU) is a Northeast Ohio based organization that strengthens nonprofits by involving thousands of volunteers from the community; engaging hundreds of business executives and professionals on nonprofit boards of directors; and providing leading-edge board and management consulting and training services for nonprofits.